Yahoo News relaunched its app yesterday; it included a new design and features to deepen trust with its audience. The "fact-check feature verifies statements and claims made in a news article. The fact check is based on research from Yahoo's editorial news team and its partnerships with AP and Reuters, "both of which have vast fact-check desks," Wallace said. The app has a mix of content aggregated from other publisher partners and original reporting from Yahoo News. “The 360,” another new feature, highlights multiple stories on the same news topic from publishers, including the AP, Bloomberg, Time, Fox Business, HuffPost, ABC News, Reuters, The Guardian and CBS News, among others. "We wanted to help users see all angles on the most important stories of the day, so they could better understand the issues and inform their own perspective, as we know the truth matters," Wallace said. Yahoo News has long featured content from its publisher partners alongside its own original editorial. The new Yahoo News app has a “Top 10” list of the most important daily stories for users, curated by editors. It also includes one entertaining, fun story each day. 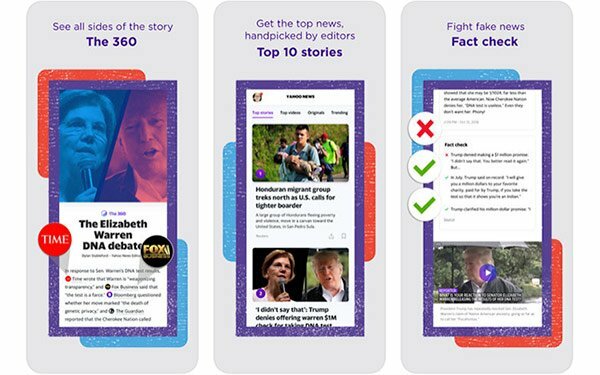 Yahoo News app users will continue to get breaking news alerts, as well as exclusive content like the politics podcast “Skullduggery,” original video series "Unfiltered" and enterprise stories and investigations from its journalists. Yahoo News app installs are reportedly up 58% year-over-year. The revamped app is available on iOS or Android today.